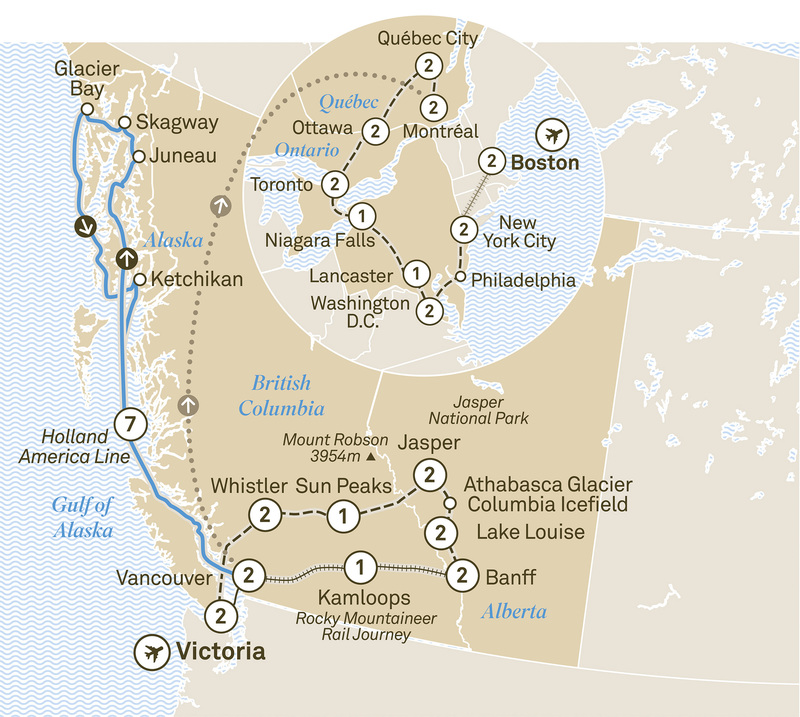 This 38 day journey from Victoria to Boston will see you experience the best of Canada, Alaska & the East Coast USA. Highlights include Niagara Falls & NYC. Your journey into wonder begins with an exclusive two night Special Stay at Victoria’s iconic The Fairmont Empress. Celebrate tonight with a welcome dinner and toast to the adventures awaiting you and your fellow travellers. Explore the spectacular Butchart Gardens. Discover its 100 year old history and 900 varieties of plants. Look out for orcas on a whale watching cruise by Zodiac or cruise boat. Alternatively, choose to take a scenic floatplane flight, a horse and carriage ride or indulge in afternoon tea at The Fairmont Empress. Prepare to capture the majesty of the natural wonders and unique sights on a photowalk designed for Scenic guests. Learn all the tips and tricks to capture the perfect shot on your mobile device. Cross Georgia Strait by ferry. On arrival in Whistler, visit Squamish Lil’wat Cultural Centre. Join renowned black bear expert researcher Michael Allen for an enlightening session about these extraordinary creatures. Choose from a selection of restaurants in Whistler. Enjoy a two night Special Stay at the exclusive Fairmont Chateau Whistler. Whistler is an outdoor adventure playground and today you get to choose how to make the most of it. Soar above Whistler on a Helicopter flight. Enjoy the view by Zipline or Peak 2 Peak Gondola, take a mountain adventure tour or a thrilling jet boat ride. Arrive into the alpine village of Sun Peaks for a relaxing stay at the Sun Peaks Grand Hotel. Travel via Mt Robson, the highest peak in North America’s Rocky Mountain range, en route to Jasper. Enjoy rustic-style accommodation at the Fairmont Jasper Park Lodge, set on the banks of glacier-fed Lac Beauvert. Jasper National Park is one of the world’s largest Dark Sky Preserves. Join astronomers from Jasper Planetarium for a breathtaking dark sky experience and an exclusive supper under the stars. Drive along one of the most famous roads in the world, the Icefields Parkway, then take an ‘Ice Explorer’ onto the Athabasca Glacier. Reach Lake Louise, a true natural wonder, and the opulent Fairmont Chateau Lake Louise where you’ll enjoy a two night Special Stay in a stunning lakeview room. Enjoy a choice of restaurants at your hotel tonight, from fine to casual dining. For the early riser or the budding photographer, set a sunrise wake-up call to capture the stunning colours painted across the mountain, lake and glacier outside your window. Meet a retired member of the Mounties for an insight into their role in Canadian history and the country today. Small town charm nestled in stunning mountain scenery greets you in Banff. Settle into your two night Special Stay at the Fairmont Banff Springs, where you’ll enjoy a fabulous mountain or valley view room. Choose to ascend Sulphur Mountain on the Banff Gondola for awe-inspiring views of Bow Valley or take a helicopter flight over the Three Sisters Peaks. Alternatively, enjoy a Bow River float trip, take a guided nature hike, rejuvenate in relaxing mineral pools, play nine holes of golf or head into the mountains by wagon for a cowboy cookout lunch. In July, you can also take a day trip to the famous Calgary Stampede. Whichever activity you choose, you’re sure to be swept away by Banff National Park, the first national park established in Canada and a World Heritage-listed Site. Head out at dusk on a unique wildlife spotting experience in search of Banff’s magnificent beasts including deer, elk, caribou and the elusive grizzly bear. The Rocky Mountaineer is one of the most iconic rail journeys in the world, and you’ll relish your two days of GoldLeaf Service. Enjoy this ultimate treat for the senses, as you carve through the otherwise inaccessible terrain of the Rocky Mountains in luxurious comfort. Gaze in awe through the glass-dome windows as you soak up the magnificent scenery stretching as far as the eye can see. Savour delectable delights and sip on local beer and wine in the company of your newfound friends. You don’t have to be an engineer to delight in the ingenious construction of the spiral tunnels you’ll venture through. Tonight, stay at a Kamloops hotel assigned by Rocky Mountaineer. View the confluence of the Fraser and Thompson rivers from your glass-dome carriage. Later, you’ll arrive at the exclusive Fairmont Hotel Vancouver, where you’ll be comfortably appointed for the next two nights. Absorb the tranquillity of Capilano Suspension Bridge Park as it opens early, exclusively for Scenic guests. A sightseeing tour will showcase Vancouver’s hidden treasures. Tonight, join your Tour Director and fellow adventurers for a celebratory dinner as you farewell Canada and prepare for the next part of your journey – cruising Alaska, the last frontier. Join your Cruise Director for a luxurious seven night Alaskan voyage on board Holland America Line’s ms Koningsdam or ms Volendam in a Verandah Stateroom. Alaska’s charming state capital is only accessible by air or sea, so go ahead and explore knowing you’ll never get lost. A National Park Service Ranger will interpret the natural wonders you see in this spectacular area. Continue cruising south towards Vancouver then celebrate your Canadian and Alaskan escapade with a farewell dinner. Disembark and fly to Montréal for a two night stay at Fairmont The Queen Elizabeth. (Flight not included in land only tour price, please book your flight to depart after 2pm.). Visit the exquisite Notre-Dame Basilica in Old Montréal, with its imposing Gothic Revival architecture. Later, take a guided tour through the city. Be sure to check out Montréal’s underground city where many locals spend their time during the frosty winter. This evening you can look forward to enjoying dinner with your Tour Director and fellow travellers. Discover the fascinating history, architecture and culture of Québec City as you stroll through the cobblestone streets of North America’s only walled city on a tour of the old town. Begin a two night Special Stay at the Fairmont Le Château Frontenac in the heart of Québec City. The iconic château is the world’s most photographed hotel, as it dominates the city skyline and is visible from almost anywhere in the city. Today, you can choose to tour Québec City by foot or fly over it. Alternatively, take a culinary tour to taste the finest produce from local artisans who have created a gourmet buzz in Québec. Parc Oméga is home to bears, wolves, wapitis, red deer, beavers and more. View the wildlife as you journey through the 1,500 acre park. Straddling the Rideau Canal, Canada’s capital city Ottawa is nothing if not elegant. And for the next two nights, you’ll enjoy a more elegant experience than most at the iconic Fairmont Château Laurier, located steps away from Parliament Hill. Tonight, select between local restaurants or your hotel. Discover the charm of Canada’s capital on a guided tour. Canada’s history comes to life with a visit to either the Canadian Museum of History or the War Museum, or you could discover Ottawa’s scenery on a river cruise. If you are a ‘foodie’ then you’ll love the ByWard Market Culinary tour. Toronto is Canada’s largest city. When it opened in 1929, the Fairmont Royal York was the tallest hotel in the British Commonwealth. It has welcomed royals, presidents and dignitaries alike, and today it will also welcome you for your two night stay. Be treated to stunning views of the city and Lake Ontario from Toronto’s CN Tower. Not afraid of heights? Then step out onto the glass floor and outdoor observation area. Today, you’ll cruise to the base of Niagara Falls and enjoy the deafening roar of the cascading waters before retreating to your overnight Special Stay, the Hilton Hotel and Suites, Niagara Falls, where you’ll get to marvel at the view from your Fallsview room. Welcome to the USA. Savour a traditional home-style Amish feast, then settle in to the Lancaster Arts Hotel. Day 32 - Lancaster > Washington D.C.
Visit an Amish farm and house for an insight into the Amish culture, faith and way of life. Later, you’ll travel to Washington D.C. for a completely contrasting experience. The luxurious Fairmont Washington D.C. is your home for the next two nights. Day 33 - Washington D.C. Enjoy a guided tour of Washington D.C. and gain a greater understanding of its enormous historical significance and influence. Explore the historic city of Philadelphia before travelling to cosmopolitan New York City where you’ll stay two nights in the Renaissance New York Times Square. Explore incredible New York City on a hop-on-hop-off double decker bus tour. Nothing epitomises the excitement of theatre more than a Broadway production. Tonight, you’ll be treated to an unforgettable show in this entertainment mecca. Amtrak’s Acela Express takes you to Boston. Relax in your Business Class seat and enjoy the superior comfort and service before arriving at the Fairmont Copley Plaza or similar for a two night stay. Soak up the unique culture, with its fusion of the historical and the contemporary. A hop-on-hop-off tour of this historic city takes you to Boston Common, Quincy Market or Harvard University. Wander to your heart’s content. Boston is an independent extension, not escorted by a Scenic Tour Director.